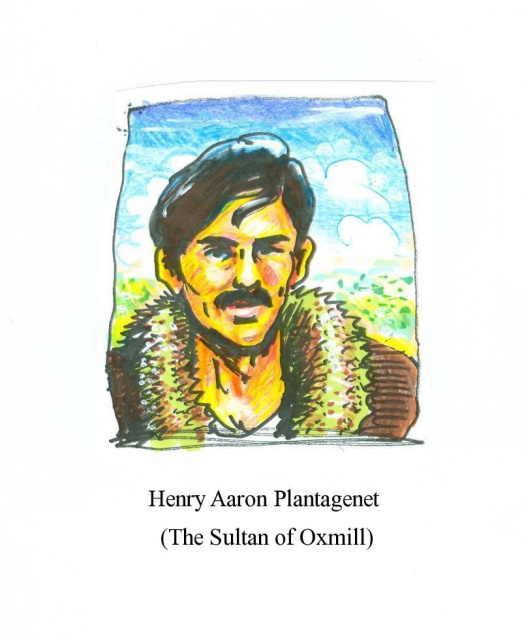 It is only because the man who calls himself the Sultan of Oxmill vanished into the mysteries of time, rather than getting lost in space, so many years ago, that I am able to call him so familiarly, and yes fondly: Henry. I spent more than four decades in the employ, the service, and the personal regard of Henry Aaron Plantagenet. Most of the things he did and experienced while I worked for him were so strange and unusual that many would stagger the reader's imagination or even arouse disbelief! Many of them I did not witness or know of, however those I did participate in to some degree were fantastic enough. It is not my way to work for anyone impersonally, and over the four decades I spent with him, mostly at his Taj in Next Mexico, I grew to love and admire him. It was almost as if Henry replaced my own child, David Arland Dish, who died in his infancy long before I even knew who Henry Aaron Plantagenet was, or is. I do not claim to be able to define this remarkable man or put my thumb (I am told it is green) on his nature. Yet if any living human being knew his character, his nature, his person closely from experience, I was that one. Most of Henry's other relationships were either extremely professional and technical, or wildly whimsical and intense and short-lived. However the important story, the most intriguing,meaningful, and haunting to me, is what happened with his time-travel back to ancient Egypt. After he came back he said that time was more like a circle, the expansion of a point. He said a point simply located the idea of space, and yet its expansion through consciousness makes a 2D circle or a 3D sphere we call time. He said time is not like a line or a river at all . . . though it has something in common with a river. I don't understand any of this at all; dear me, no! I got most of the details from Miss Veng and Dr. Cannis, who also returned when Henry did, or at almost the the same time. Only Henry himself did not talk about it much. Fortunately he verbally recorded a personal, private diary quite consistently from the time he returned from ancient Egypt until the time not many years later when he vanished, apparently for good. I confess I still don't understand at all what he said about time. It doesn't even make sense after I have compiled what I learned about the time in Egypt. There was a beautiful young boy, who they said was going to become King. It is this Nef I know the least about. But I know that he had a friend, a boatman called Kenmet who saved his life and sacrificed himself to a monstrous River Snake, which Nef then killed with a harpoon. The even more mysterious part of it may be the crux. Two of the five who went back to 1,540 BCE through the NEB Process never returned. Their names were Nicholas Sealmarsh and Heru Castle. Heru's mother is Owarini Mary Castle, a retired Amazon. 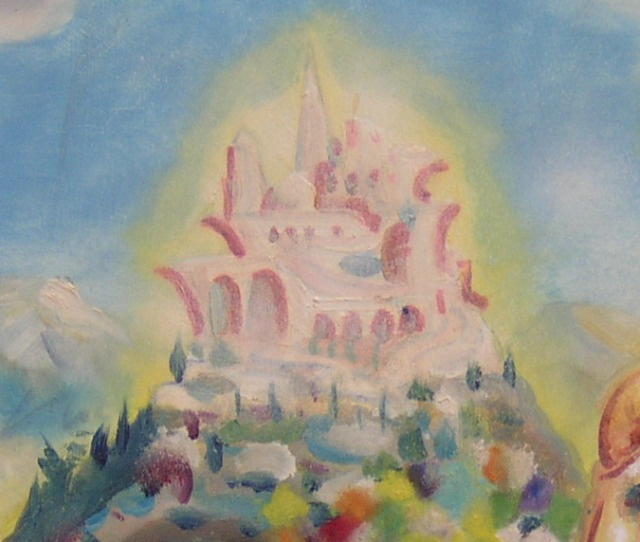 She spent several weeks at the Taj as Henry's personal guest, only she got neither satisfaction nor much information from him, and returned sadly to her home on the planet Dibulla. I felt sorry for her, yet what could I do to help that situation? Very little it seemed. Interestingly, the father of Nick Sealmarsh was also a well known figure during the Civil War on Johnson many years past. His father Denton was born on the destroyed world, Gaia-1064, and narrowly escaped its annihilation. Denton Sealmarsh and Nick's mother (she was also an Amazon, though still active at the time they came to Oxmill) and Henry patiently, if inconclusively entertained and befriended this couple also. Yet like Mary Castle, they went away without much to go on. 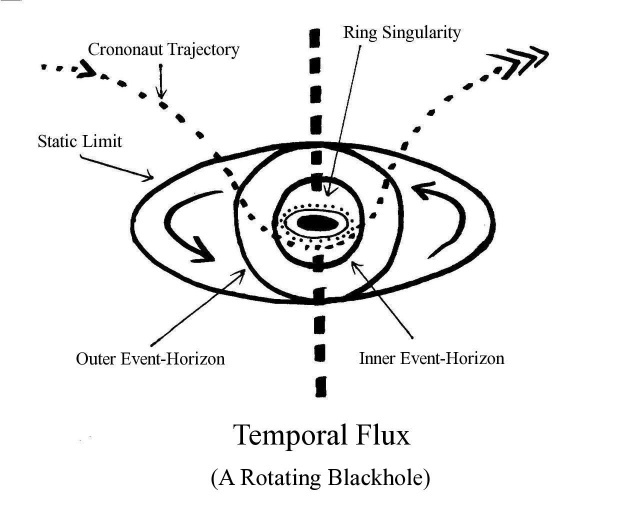 I knew that the hyperstasis fields of Heru and Nick were still being maintained; the pattern of their living matter was waiting, recorded atom-by-atom in a sense. It was always possible, or would always be possible so long as the hyperstasis fields were maintained, that these two people might return also. Then again, Henry explained to me that they might never, or if the maintenance machinery ever failed they would have no chance of returning. Henry's fortune is supposed to assure that those two hyperstasis fields--one labelled "H. Castle," the other "N. Sealmarsh"--will be maintained in perpetuity. All I can say for certain is that as of now, Stardate 3299, they are still there and who knows what will come. I'm not sure where or when Henry himself went. He was talking a great deal about how it was now just as easy for him to go into the future as it had been before for him to travel into the past. Only he said that he was not so sure about coming back from the future into the present. He told me it might not make sense anyway, or he might not even want to return. This frightened me of course. I had long before learned that to love Henry, in particular like a son the way I did and still do, was to accept his recklessness as well as his generosity and his relentless humor. He was never content with safety and serenity alone; but the kind of dangers most men feared meant nothing to him. He placed himself in positions that would drive most bold people mad. And he always emerged even saner and wiser, as far as I could tell. Yes, I love him as perhaps I would have loved my David Arland if he had grown up into a man. Henry was always more than an employer to me, though for my own sake I was compelled to take control of myself emotionally and eventually to find other employment, following the morning I discovered that he had not slept in his bed. We also found the door to the warehouse where he kept his collection of Time Machines, near the Taj, wide open. Many of the machines were switched on or activated--they hummed and crackled and sang like a fleet of electric humpback whales. When we managed to cut all of the power to the collection, we found Henry's footprints leading into one of the machines in particular. He was not inside of it. However it had broken down, crystal tubes lay shattered all over the place. We found no footprints leading out again. One more peculiar twist to his disappearance was the being that we did find wandering, quite bewildered, among the hushed machines. As if one of the devices or mechanisms had belatedly regurgitated someone it had swallowed decades before . . . it was T'Bring, the Nautiloidi representative who had vanished from the Taj long ago! T'Bring did not seems to understand what had happened, or to have experienced any significant duration since Hir disappearance all those years before! SHe had wandered in, and according to Hir account, wandered back out after a short time. Only it was more than twenty years later, at least in my timeline. These are the kind of enigmas of time that living in the Taj exposed me to and I no longer felt bewildered by what I failed to understand. Really I got no consolation for the disappearance of Henry from the strangely evocative, haunting image of poor T'Bring chuffing and tweeting along on Hir one leg and waving her tentacles with all three eyes lifted high. I can tell it will not be easy to finish these brief confessions, though I strongly feel that the truth, as much as I know, must be told. Since the Nine have been governing the galaxy from Cloud House on Johnson, everything is different, and in some way perhaps everything is always much the same. Henry asked me to do an exhaustive research into Egyptian history to try to determine what changes might have taken place around 1,540 BCE or shortly after. He seemed to think that the chronology of the kings and dynasties might have been modified by the excursion of five people from the present into that living past. I had not known enough about history before they departed to know if it had been changed by the time they got back. It is the kind of paradox that is in fact imponderable. If a change had been made, how would we know it? The change would also erase our current memory of how things had been before. Still I did discover that until that date the unified Upper and Lower Kingdoms of Egypt had been ruled by a succession of kings for many centuries, every one of whom ruled in the name of Heru, a god the Greeks called "Horus," the son of Osiris, the first king. Heru had succeeded his slain father only after a struggle for the throne with his uncle Seth, the brother and murderer of Osiris, for Seth also claimed the throne of the Two Lands. In about 1,540 BCE, Seth the Lord of the South, or his followers, had taken the throne and crown when a weak old king named Ahmose had apparently been murdered by the priests of Amun, to make way for Seth to rule at last. Had it always been so? Were the subsequent dynasties and kings and queens who ruled Egypt in the name of Seth and his wife Nephthys in the history books before the NEB experiment? Or had history been altered somehow, and had it once been different? I have been unable to determine this, and perhaps it is not possible. Perhaps Henry's assignment on this was more of a koan or riddle, an insoluble paradox than a linear search for what happened. As I have stated, I cannot determine the answer. If as Henry hinted, he felt that things had been changed, perhaps the nature of time travel itself makes this a meaningless mobius-strip to follow. I must admit that I don't understand time at all. The only thing I discovered that suggests he might have been right or partly right in this is the fact that until 1,540 BCE Egypt was ruled in the name of Osiris and his son Heru, the Golden Falcon, the Avenger of his Father. The images and inscriptions of this particular Sun God were methodically destroyed and eradicated at about that time. But in the complex mesh of Egyptian culture, we know that until then Heru was venerated as the Lord of Light. After then, Seth and his sister-wife Nephthys, the Lord and Lady of Twilight became the models of royalty and divinity until the long decline of Egypt ended. Henry always told me I would be quite at home in ancient Egypt. I always told him I didn't believe it, but maybe he was right! One of the memories that haunts me the most, and most clearly stands before me (literally) for they are now mine, and I am looking at them this moment, is the two small gold figurines from the Eighteenth Dynasty of Egypt. Henry discovered these in the hands of an unscrupulous antiquities dealer. I must admit that Henry knew quite a few of those. Perhaps these exquisite little figures were stolen; at some point someone removed them from Egypt itself. Scientific study has verified their origins and antiquity. They are a little couple, seated side-by-side on twin thrones, atatched to a single base. The hieroglyphics on the bottom of the base identify them as "Lord Seth and Lady Nephthys." The most striking thing about them however is that perhaps, as Henry insisted, these tiny golden deities some six thousand years old are portraits of Nick Sealmarsh and Heru Castle. I have many times compared them with holographs of Castle and Sealmarsh. Lord Seth looks exactly like Nick and Lady Nephthys looks exactly like Heru. It appears the beautiful little statuettes were rendered as lifelike portraits, rather than idealized images! He sits with the crossed crook and flail at his chest, and wears a slight smile beneath his mustache--the facial hair rare though not unknown from Egypt--and she has the symbol of a house on top of her head. I don't think it is only that Henry suggested this resemblance. Many others have confirmed the obvious likeness. They sit before me now. Only what always puzzled me--and you can tell that I have many, many unsolved puzzles in my life--was when Henry asked me, not long after returning from ancient Egypt, "Was anything basically different before we went and returned? I mean, was history different? Or culture, or religion? We switched some important things around, I think. Everything should have changed quite drastically . . ."
I couldn't say that it had. But of course things certainly changed. -- Amelia Constance Dish, 3299 S.D.